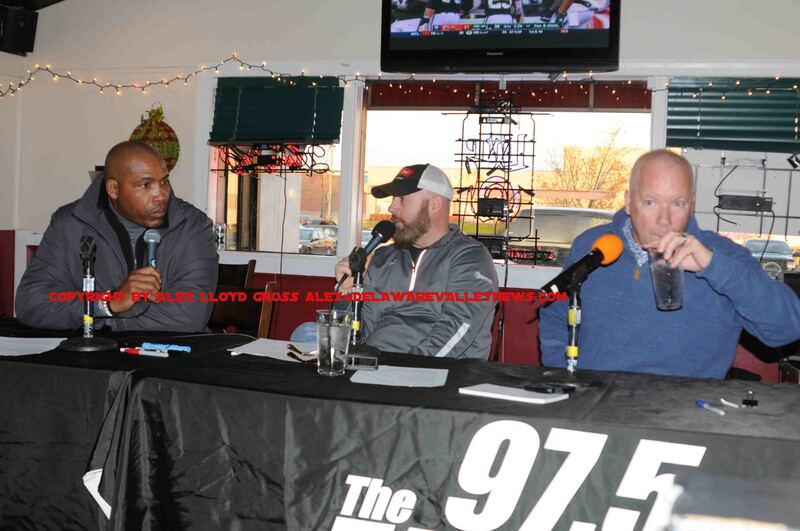 Seth Joyner talks sports with Jason Myrtetus and Bob Cooney from 97.5. Most football fans when they get ready for a game, like to order food, get some drinks and kick back, listen to sports radio or watch a game until their team’s game comes on the screen. In fact, if you go to Lincoln Financial Field, you will find that some people have spend a ton of money on mobile wagons that have TV, a sound systems and grills built into them. They are the ultimate tailgate vehicle. Some even come with an awning or protection from bad weather. All that pales in comparison to what happened today at Nicks Roast Beer. Today, December 3, 2017. the Philadelphia Eagles will play in Seattle. Right now the Eagles are the team to beat and not too many teams are beating them. With a 10-1 record, they are red hot and interest in the team has never been higher. As fans got ready for the 8:30 PM kick off, quite a few people went to Nicks Roast Beef, on Cottman Avenue, in Philadelphia. They had a tailgate party. 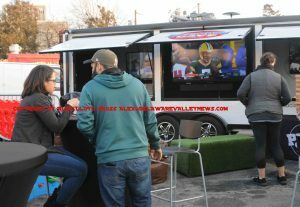 Alex Lloyd Gross Photo- Delaware Valley News.com Ruan and Angela Martos enjoy some food as they watch football outside at Nicks Roast Beef. There was food and drink of course, but there, fans got to hang with Tra Thomas, Ron Jaworski, as well as Seth Joyner. Hang out with means exactly that. There was no closed off VIP area, where the former football greats emerged from for 10 minutes to shake hands and leave. Just the opposite. They were sitting down and watching other football games with fans, and offering their commentary. Imagine sitting down and talking sports with Thomas as the Minnesota Vikings were playing on TV . Of course, there were plenty of autographs signed and selfies taken. Upstairs, sports casters Jason Myrtetus and Bob Cooney from 97.5 were having a sit down with the players. Fans could ask any question they wanted. It was not broadcast on air. Te entire event lasted three hours. Outside, in the rear lot, games and tailgating activities were set up. Of course, Nicks Roast Beer staff were hoping that fans would stick around and watch the game there as well.